SAS taps machine learning to speed model development and testing and overcome the talent shortage. Automation delivers hundreds of segment-optimized, big-data-ready models in minutes. SAS on Tuesday marked the general release of SAS Factory Miner, an automated tool that uses machine learning techniques to develop, test and identify hundreds of best-fit predictive models within minutes. Announced last month, Factory Miner promises better, segment-specific predictive performance, and it also goes a long way toward easing the analytic talent shortage. SAS Factory Miner is designed to automatically train, test and identify best-fit predictive models for hundreds of segments with just a few clicks. Embrace fine-grained segmentation: Companies are moving to tighter and tighter segmentation schemes – whether by customer, product, region or other variables. A fine-grained approach improves predictive accuracy, whether the models are aimed at upselling, predicting churn or spotting risk. The downside of using more segments is that you’ll have to develop, test, optimize and maintain that many more models. Use all available data: More data brings higher accuracy, so the push in analytics has long been to use every scrap of data available, even when it’s big data spread across distributed systems. When data is at scale, you don’t want to have to rely on time-consuming data movement or sampling techniques that diminish accuracy. That’s why SAS and others have been moving to in-database, in-memory and, most recently, in-Hadoop modeling and scoring approaches. You bring the analysis to where the data lives. Overcome the talent shortage: As per the laws of supply and demand, analytics expertise is scarce and costly, yet the two imperatives detailed above exacerbate the problem by tasking analysts to build more models and use more data. That means you’ll need more time and talent to build, test, deploy and maintain predictive models. SAS Factory Miner is a response to all of these imperatives. It helps companies with find-grained segmentation by automating model building across hundreds of segments and, potentially, thousands of sub-segments. The modeling power behind the scenes is machine learning, including regression, neural network, decision tree, random forest, gradient boosting, Bayesian network, and support vector machine approaches. These techniques spot the best-performing model for each segment, but it’s not a black box; you can see what makes each model tick and tune and tweak it as required. 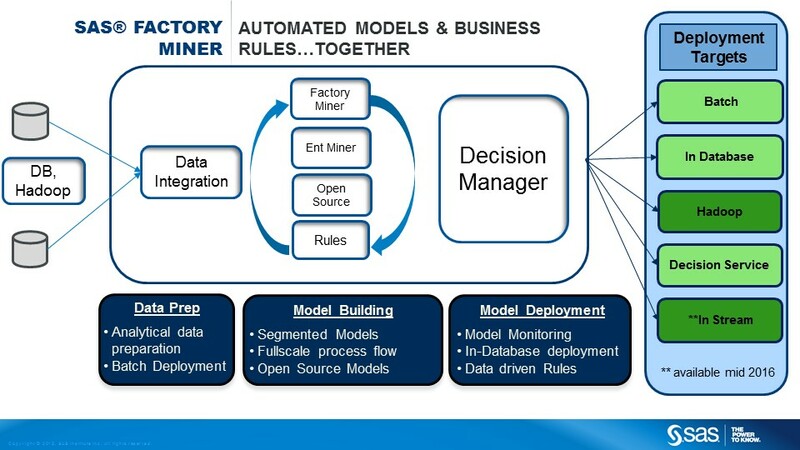 Factory Miner provides templates that can be used to configured each step in the model-building workflow, including data cleansing, transformation, and variable and model selection. Users can rely on default settings or build and share templates incorporating internal practices and standards. Factory Miner is an HTML5-based app that runs on SAS Server and in SAS High-Performance Analytics, so it can model against all the data in high-scale databases or Hadoop clusters. Similarly, all models generate in-database/in-Hadoop compatible score code, so they can be efficiently deployed and maintained with the help of integrated tools including SAS Model Manager and SAS Decision Manager. SAS Factory Miner is integrated with the vendor’s larger ecosystem, including (high-scale database and Hadoop) data sources and deployment options. To give you a bit of context on analytic productivity and progress, I recently sat in on a presentation by an analytics executive at a major casino hotel chain. A Teradata and SAS shop, this company has many hotel properties and a marketing database that reaches more than 1.7 million customers. Some customers respond to food-and-beverage offers, others like entertainment deals and still others are strictly into gambling. Some customers prefer the fancy hotels while others want low rates. Four to five years ago, this company segmented customers into just 12 buckets, and its targeted email campaigns drove seven-figures revenues each quarter with 30% margins. Today the company targets more than 160 segments, and with improved predictive accuracy it’s driving eight-figure revenues each quarter with margins exceeding 50%. This company relies on automated Teradata digital marketing apps to ease the burden of all that campaign management and measurement, but a separate analytics staff develops and maintains all those models. What if it could develop and assess double, triple or four times that number of models with a few clicks? Why not go for even finer-grained segmentation? It’s early days for Factory Miner, but customer development partner Turkcell, a leading Turkish Telco, says the tool has helped it increase model lift and promote collaboration and modeling best practics through sharing of templates across departments. SAS Factory Miner isn’t the only automated data-mining tool I’ve seen out there, but with its combination of scalability, data-access and model-deployment options, it’s tailor made for the segmentation demands, the data scale and the talent constraints of these times.